The memo written by Jeremy Hunt in November about News Corp's BSkyB bid seems to explain almost everything that transpired in relation to the bid over the succeeding six months or so. "What James Murdoch wants to do is to repeat what his father did with the move to Wapping and crate the world's first multi-platform media operator, available from paper to web to TV to iPhone to iPad. Isn't this what all media companies have to do ultimately? And, if so, we must be very careful that any attempt to block it is done on plurality grounds and not as a result of lobbying by competitors. The UK has the chance to lead the way. But if we block it our media sector will suffer for years. In the end, I'm sure sensible controls can be put into any merger to ensure there is plurality." Mr Hunt is saying that the creation of an integrated media giant - containing News International's newspapers, Sky's television, and both businesses' online and digital operations - would be a very good thing for the UK. And, more importantly, if the regulator takes a different view, then there would be ways of getting the deal through by imposing conditions on News Corporation. As it happens, the regulator Ofcom did take a different view. On 13 January 2011 I reported that "Ofcom has made an unambiguous recommendation that News Corp's plan to acquire all of British Sky Broadcasting should be referred to the Competition Commission for further investigation." This was a scoop, which you can read here. "What I don't understand is why Jeremy Hunt, the culture secretary, has not simply published the report and announced that there will be a further Competition Commission enquiry into whether the takeover restricts plurality in the media (or choice for viewers and readers). Instead, he is having talks with BSkyB and with News Corporation (which already owns 39% of Sky and various British newspapers, including the Sun and Times), as the Guardian disclosed a few days ago. "What is there for Mr Hunt to talk to NewsCorp and Sky about, if - as I say - 'Ofcom's advice is clear and unambiguous'?" On 25 January it became clear what Mr Hunt had been talking to News Corporation about. Mr Hunt decided to give News Corp a couple of weeks to come up with what are known as "undertakings in lieu", to remedy the harm identified by Ofcom. To digress for a second, one explosive aspect of this extraordinary drama - which I expect the Leveson inquiry to explore with Adam Smith, Hunt's former special adviser, this morning - is whether Mr Smith may have breached City disclosure rules by tipping off News Corp about Mr Hunt's statement to the markets about all this a day in advance, on the afternoon of 24 January (this is something the City regulator, the Financial Services Authority, is examining). But to return to the main point, on 25 January Mr Hunt disclosed he was doing what he had said he would do in that secret memo to the prime minister of November: he was looking for "sensible controls" that would allow the merger to proceed. What were those "sensible controls"? Well at the time I assumed that they would involve BSkyB spinning off its Sky News operation in some way, since it was the combination of Sky News and News International's newspapers that was of greatest concern to Ofcom. And that was confirmed on 3 March. The clever wheeze that Mr Hunt had negotiated with James Murdoch of News Corporation was that News Corporation would spin off 61% of Sky News into a new independent company, which would have a new board of its own and would be funded by News Corporation for a decade. In this way, News Corporation avoided the deal being sent to the Competition Commission for a long, detailed and expensive investigation - which is something that News Corporation was very keen to avoid (I know this because I was in regular contact with the company at the time). Now, to be clear, Mr Hunt secured the formal agreement of Ofcom and the Office of Fair Trading for all concessions extracted from News Corp and James Murdoch that were necessary to avoid a further review by the Competition Commission. In other words, as Mr Hunt will say, he did not breach what the regulators wanted to achieve. Also Mr Murdoch would say that the concessions he gave Mr Hunt - such as that the board of the partly demerged Sky News should have a majority of independent directors and that the chairman of Sky News should not be a News Corp employee - were very painful for him. James Murdoch would say that Mr Hunt was being tough on him. But here is the important fact: concessions were negotiated between Mr Hunt and Mr Murdoch that would have allowed the takeover to take place - if the deal had not eventually been blown up by the public and political furore over News International's role in phone hacking. In that sense, Mr Hunt did precisely what he implied should be done in that remarkable November memo to the prime minister. Is there anything fundamentally wrong in Jeremy Hunt having used his discretion in this way to facilitate News Corp's takeover of BSkyB? If another member of the cabinet had been in his position, would he or she have done the same? Or would most other ministers have simply taken the advice of Ofcom and referred the deal for lengthy scrutiny to the Competition Commission - with the attendant risk that an unpredictable review by the Commission might have blown up the takeover? "He [Jeremy Hunt, as relevant minister] has a power to accept undertakings, deriving from the Enterprise Act 2002 (Protection of Legitimate Interests) Order 2003, and that power carries with it a public law duty to consider undertakings if they are offered. So legally he was obliged to consider undertakings." I had better translate. Mr Hunt's defence of negotiating the remedies with News Corporation that avoided the deal going to the Competition Commission is that he was obliged to do this. Now I have spoken to competition lawyers about this. They say something a bit different - which is that Mr Hunt may have been able to consider these undertakings or remedies from News Corporation. But they add that it is not clear that he was obliged to do so - given that Ofcom's recommendation was quite clear that there should be a "fuller second stage review of these issues by the Competition Commission to assess the extent to which the concentration in media ownership may act against the public interest." In theory, Mr Hunt could have accepted Ofcom's conclusion and announced on the next working day that the takeover would be submitted to the Competition Commission for further investigation. But that is not what he did. Ofcom's conclusion was shared with News Corporation - and negotiations between Mr Hunt and James Murdoch were then initiated on how the perceived harm from the deal could be mitigated through modifications to the structure of the proposed acquisition (which, as I said earlier, is strikingly consistent with what Mr Hunt said was the best way forward in his November memo to the prime minister). It will be fascinating to see what Leveson makes of all of this. Quite a lot hinges on whether Mr Hunt chose to facilitate the takeover or was obliged to do so. I have now had a response from the DCMS to my last update. 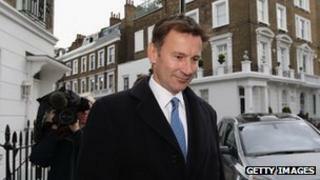 An official says that Mr Hunt had a greater duty than normal to consider undertakings or remedies offered by News Corp, because of the "situation in which Jeremy took over the bid". The concern was that News Corp "had a strong case for judicial review" of any verdict frustrating the takeover, because of Vince Cable's unguarded remarks that he had "declared war on Murdoch". b) that if Jeremy Hunt is perceived to have been too helpful to James Murdoch, he would lay the blame at Vince Cable's door.